The tea experts from NYC's Owl's Brew share tips for making tea cocktails in honor of their new book Wise Cocktails. The world of tea cocktails should not be limited to hot toddies. Accordingly, chefs and mixologists around the country are experimenting with all sorts of variations—from tea-infused spirits, to syrups, to finding new ways to play with herbal and botanical flavors. Tea experts Jennie Ripps and Maria Littlefield of Owl’s Brew have been crafting tea mixers for cocktails long before it was trendy. While looking for a mixer that would make light and interesting cocktails and that wasn’t loaded with sugar, the two avid tea drinkers began playing around with their own herbal concoctions. They now make custom blends for restaurants across the country and sell their own line of bottled tea mixers in stores and online (their new pomegranate-infused White & Vine is my personal favorite). Most recently, the young entrepreneurs have compiled all of their expertise into their first book, Wise Cocktails, out this month with Rodale Books. Organized by spirit, this fun, detailed guide to crafting tea-based drinks is filled with clever cocktails that both use their mixers and show you how to brew your own (think Moscow mules infused with white tea and lemongrass). 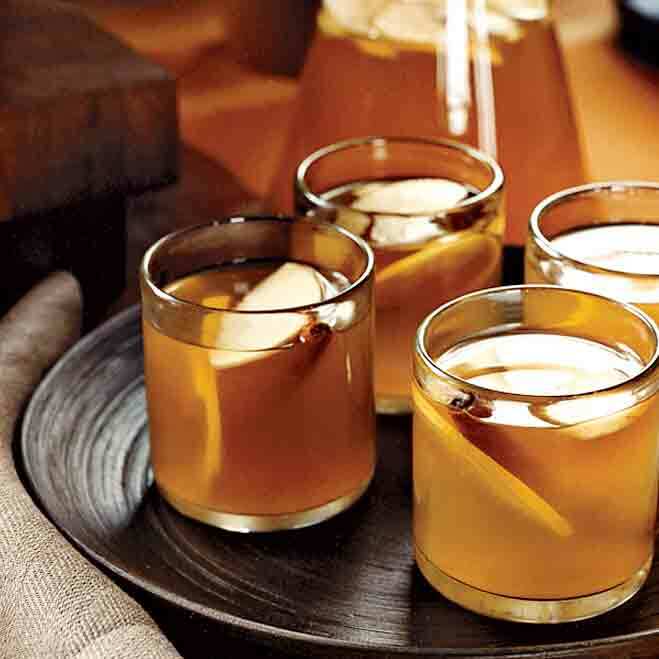 In honor of the changing leaves, dropping temperatures and the release of this awesome book, here are four ideas for smoky, spiced and warming tea cocktails to ring in fall. - Brew a double-strength tea. Jennie suggests brewing a double-strength batch of tea when you plan on diluting it (i.e. using it in a cocktail). Add twice the amount of suggested tea leaves per 8 ounces of water so that you don’t lose the flavor of the tea. - You do not have to brew tea with hot water. Brewing tea in ambient water pulls out more flavor and nutrients from the tea. For some teas, like green, the hot water will actually make the tea “turn” more quickly and dull the flavor. For small amounts of tea (less than 12 ounces), simply pour cool water over the tea leaves and let sit for 10 minutes, stirring occasionally. Larger batches should sit for 30 minutes to an hour. Strain and then use! - Experiment with your own blends. To add extra dimension to your tea cocktails, try steeping other whole ingredients with your tea leaves, such as ginger, vanilla bean, unsweetened coconut flakes, dried chilies or fruit. Play around with the amounts to suit your own taste. - 4 to 1 ratio. When crafting a cocktail with a tea mixer, Jennie uses a 4-part double-strength tea to 1-part alcohol proportion. - Get creative with your sweeteners. Agave is the go-to sweetener for Owl’s Brew because of its neutral flavor, but also consider maple syrup, honey, brown sugar, brown rice syrup or molasses. If you’re using the 4 to 1 ratio for your cocktail, 1 tablespoon of sweetener should suffice. Try this updated hot toddy: Steep double-strength green tea (look for a woodsy, roasted variety like hojicha) with a 1-inch piece of fresh ginger for 10 minutes. Mix 4 parts tea with 1 part bourbon and 1 tablespoon of maple syrup. Garnish with a strip of lemon zest and serve warm. Brew a double-strength batch of smoky Lapsang Souchong tea with a milder, fruity tea like Rooibus plus 1 vanilla bean and 1 cinnamon stick. Mix 4 parts tea with 1 part dark rum and 1 tablespoon brown sugar. Stir until the sugar is dissolved and then serve over ice. Brew a double-strength batch of Lapsang Souchong tea with a mild botanical like Jasmine (2/3 Lapsang to 1/3 Jasmine is a good place to start). Mix 4 parts tea with 1 part gin and 1 tablespoon agave syrup. Finish with a squeeze of lime juice and an orange wheel. Serve over ice. Mezcal is one of Jennie’s favorite spirits to use in fall cocktails because of its smoky profile. Brew a double-strength batch of Darjeeling tea with unsweetened coconut flakes (to taste). Mix 4 parts tea with 1 part mezcal and 1 tablespoon agave syrup. Finish with a splash of pineapple juice and a lime wedge. Serve over ice.